An easy recipe to enjoy delicious tofu! So you’ve been to Kyoto, the historical capital of Japan. You had a seven-course Kyoto tofu lunch with us. And now you might be wondering: How can I enjoy more of this delicious tofu? 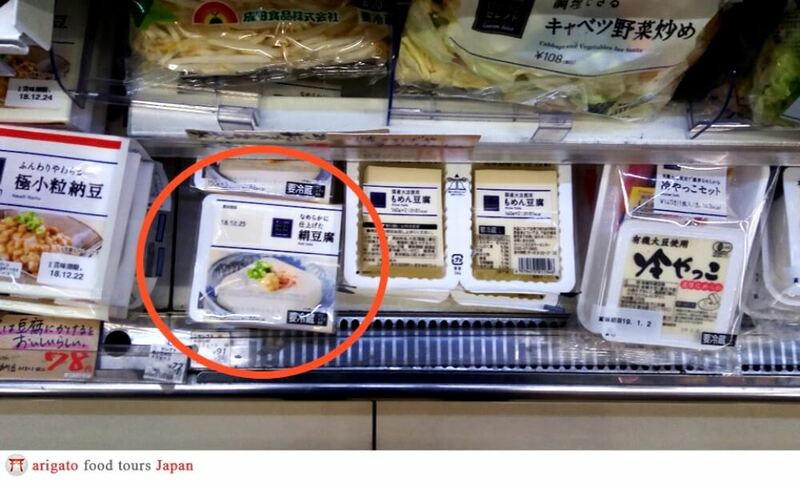 Unfortunately, tofu has to be eaten fresh. It has to be kept cold, and be eaten within a few days. Even if you pack some ice bags with it, the tofu will have soured by the time your flight lands. If you really like tofu, and can’t find Japanese tofu in Asian supermarkets back home, the only solution is to eat more of it while you’re still here. On the market tour, we bragged about how and why the tofu here is so heavenly. We’re partially to blame for your tofu craving. So we’d like to bear the responsibility and show you how to enjoy tofu, full DIY, no guides required! These recipes assume your kitchen space to be a coffee desk and a fridge, like in many hotel rooms. Kyoto holds a special spot in the hearts of Japanese. Rich in tradition, many Japanese consider it to be a very spiritual place, which explains the popularity of our lunch restaurant with domestic tourists. In reality, though, most people do not eat like this everyday! Instead, we’ll show you 3 simple, and more “everyday” tofu recipes. 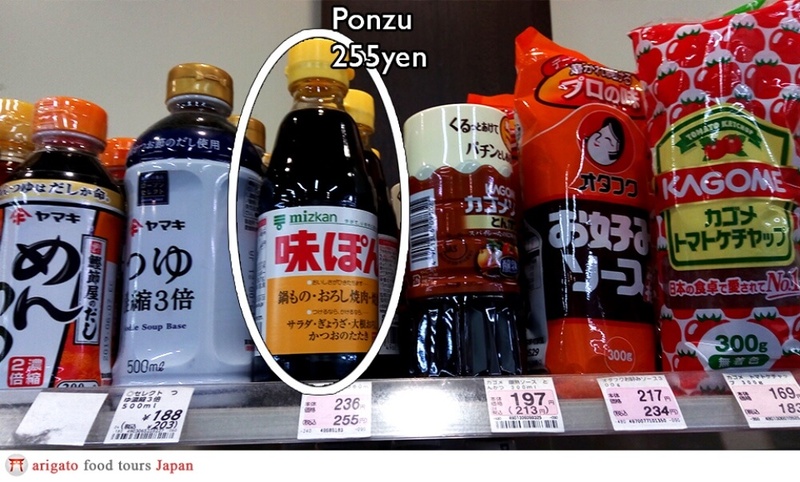 It is so simple that everything you might need can be bought from one convenience store. 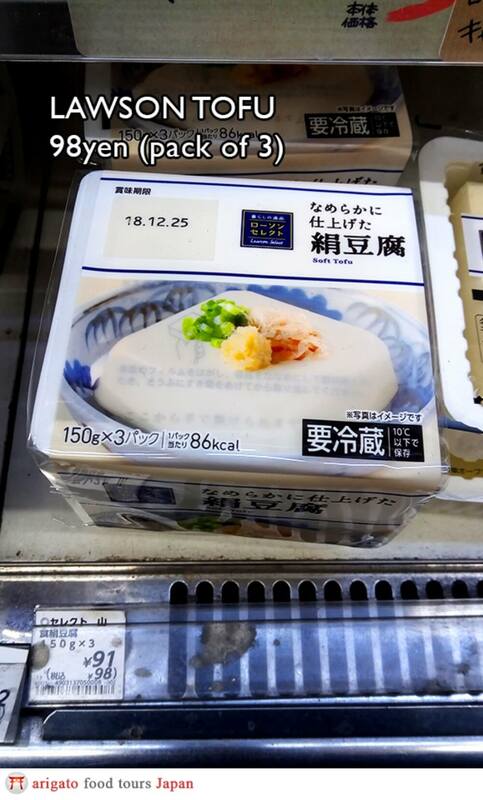 Konbini silken tofu always comes in a pack of 3. All the better, so we can try three different flavours with it! 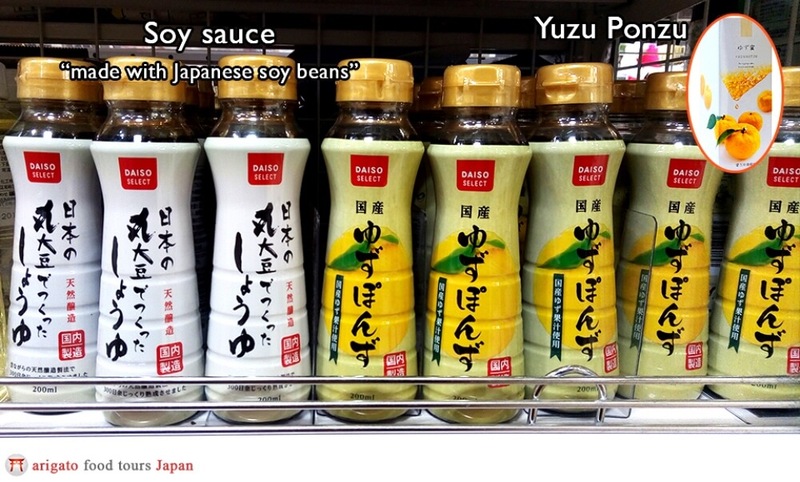 Remember – unlike sake or green tea, tofu sours quickly. Leave it on the counter for 20 minutes and I taste a difference. (But I’m a tofu snob haha my visiting friends all tell me they have no clue…) Anyway I suggest using insulated bags with ice packs inside if your commute is more than 5 minutes, and transfer your tofu to a fridge within 5-10 minutes of getting back to your hotel. At this point you can choose from three different ways to eat the tofu. 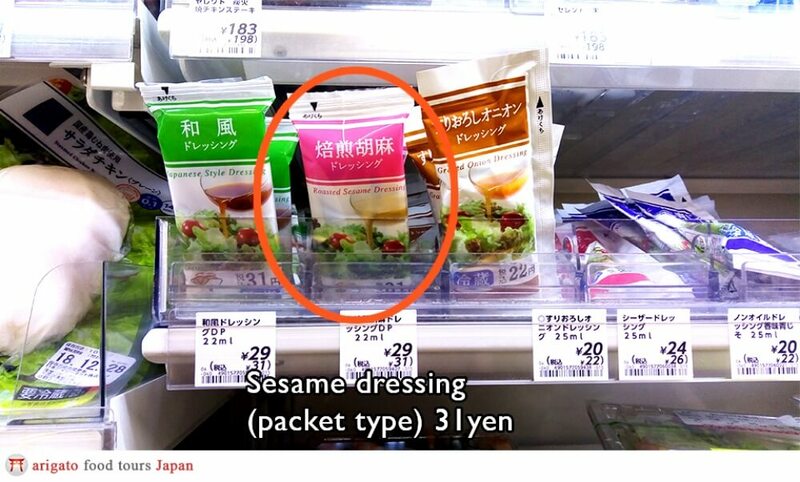 If you don’t want to bring home bottles of condiments, the sesame salad dressing comes in a small packet. 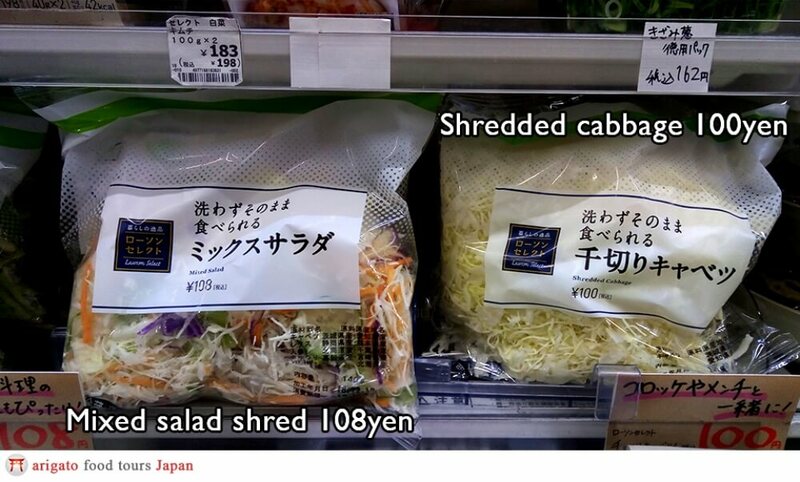 Cut salad or cut cabbage. If you add cut vegetables into your recipe, a *bit* of washing gets involved at the end. You’ll need to look for a plate. Still do-able with a hotel coffee desk as a kitchen though. 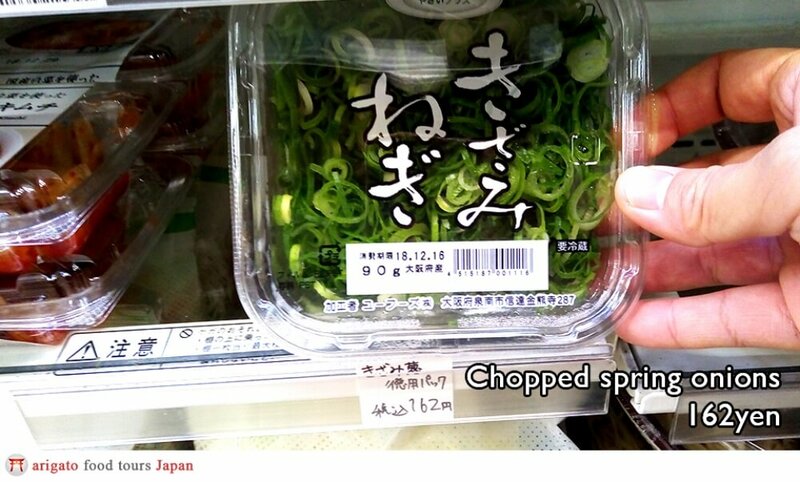 Chopped spring onions. 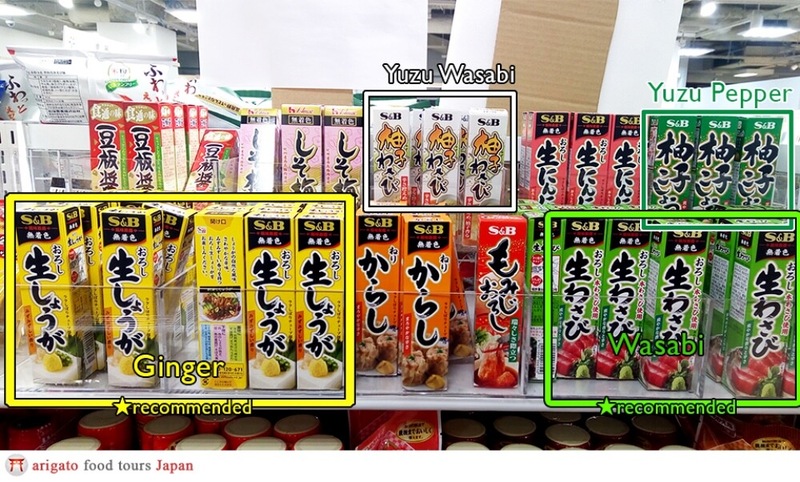 Highly recommended with ponzu. 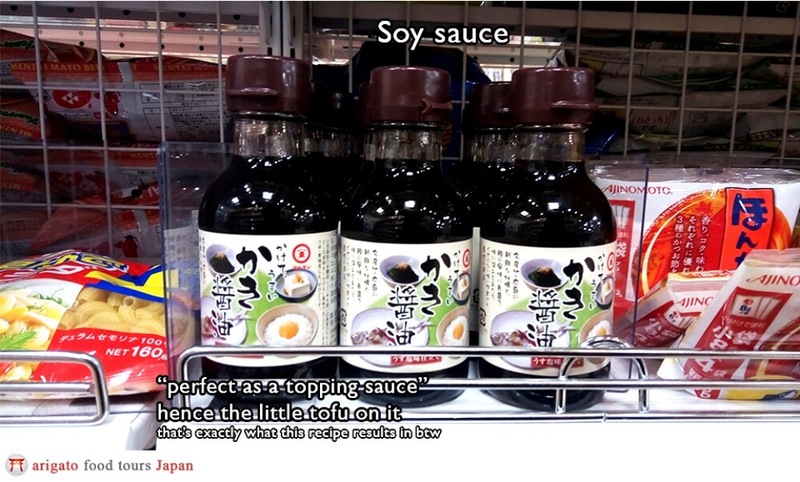 Can also be had with soy sauce. 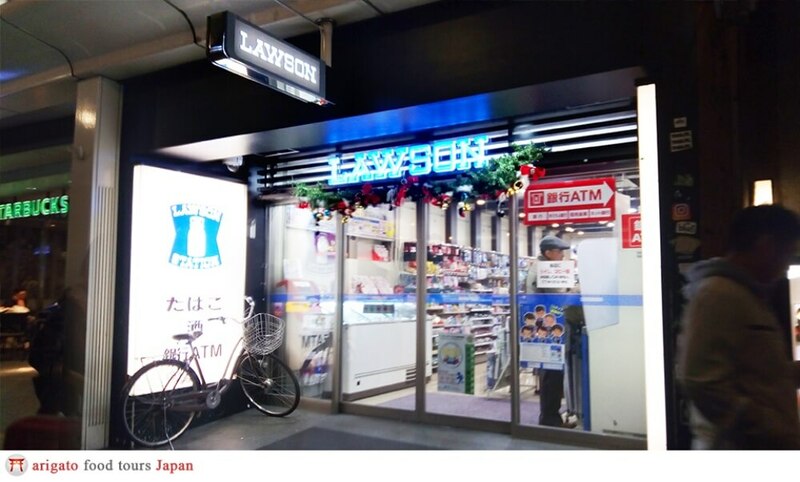 100 yen shops are very popular among both locals and tourists. You may be going to one anyway, so we’ll show you how you can find the sauces there too. At this point we’re all good. Foodies, good job, now let’s get eating. Make sure to eat it while it’s fresh! And when we’re done, the tofu box goes into the trash. No cooking, no washing, no kitchen required. Great as a small, low-calorie (vegetarian too!) snack in between sight-seeing. This is what I do for my lunch bento half the week. It is fuss-free, healthy, and most importantly tasty. I learned these ways of prepping tofu from my visits to local izakayas and from Japanese housemates. The recipe itself is really easy. 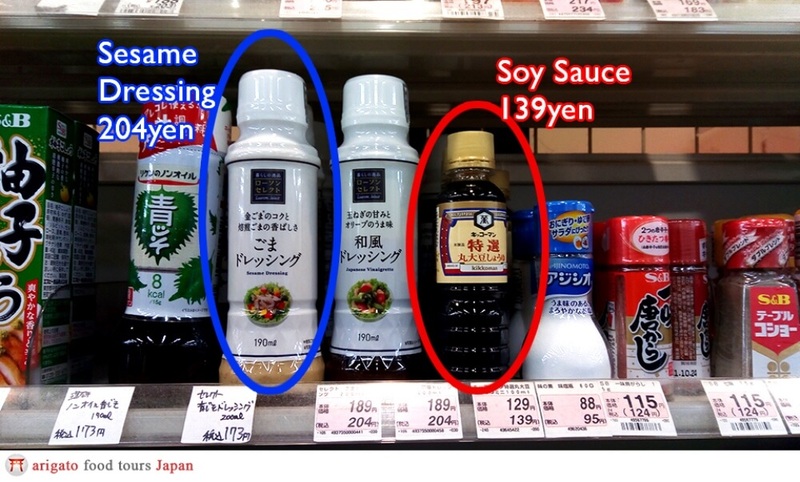 But hunting down the right ingredients may be a bit of a challenge (thanks, language barrier!) 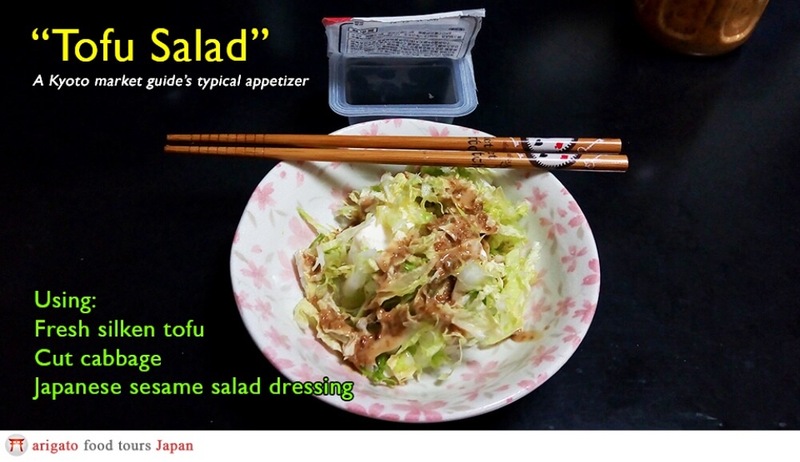 If you want to take things easy, why not find a local to guide you through a full course tofu meal instead? So, our adventurous foodies, how did your no-cook no-kitchen tofu recipes turn out? Leave a comment below and let us know! We’d love to see pics! 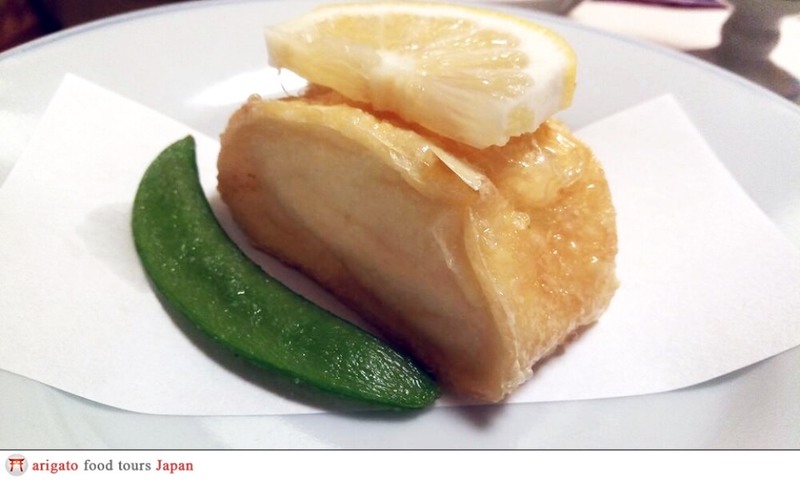 Tag us with #arigatojapanfoodtours and show us your beautiful tofu creations! 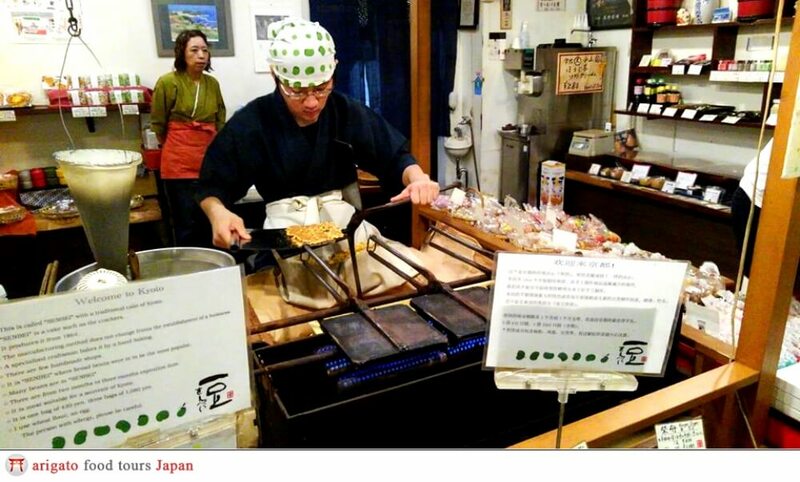 Join our Kyoto Market food tour to discover more about Tofu, while having a delicious 3-hour experience!